The Urban Politico: The Story of 3 Gitmo Detainees: Murder or Suicide? 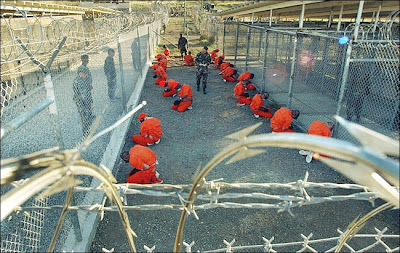 The Story of 3 Gitmo Detainees: Murder or Suicide? Yesterday, a report by Seton Hall Law School was released that concluded that the story put forth by the Department of Defense about 3 detainees who allegedly committed suicide simultaneously did not pass the smell test. Scott Horton appeared on Countdown with Keith Olbermann last night to discuss the interview he did with Law professor Mark Denbeaux who supervised the study, he asks why the new Seton Hall report doesn't assert that these deaths were murders, despite strong evidence that might point to that conclusion.